What is it with cable TV dramas and trips to Ireland? Sons Of Anarchy spent multiple episodes in the old country last season, and now in Boardwalk Empire Nucky Thompson and Owen Sleater sail across the Atlantic to meet with John McGarrigle, the revolutionary who rather self-righteously asked Nucky for money for “the cause” earlier this season. Nucky arrives in Belfast with twenty Tommy guns smuggled in a casket, and the offer of a thousand more of these “trench-brooms” in exchange for cases of real Irish whiskey. Reverting to the moralistic tone he adopted in Atlantic City, McGarrigle looks at Sleater and sniffs, “That’s the kind of man you bring me?” But there’s something else behind McGarrigle’s reluctance to deal. His son was killed recently as part of the struggle for independence; so McGarrigle’s softened, and is willing to entertain the English’s offer of a truce that will allow Ireland to be a free state —though not a fully independent one. 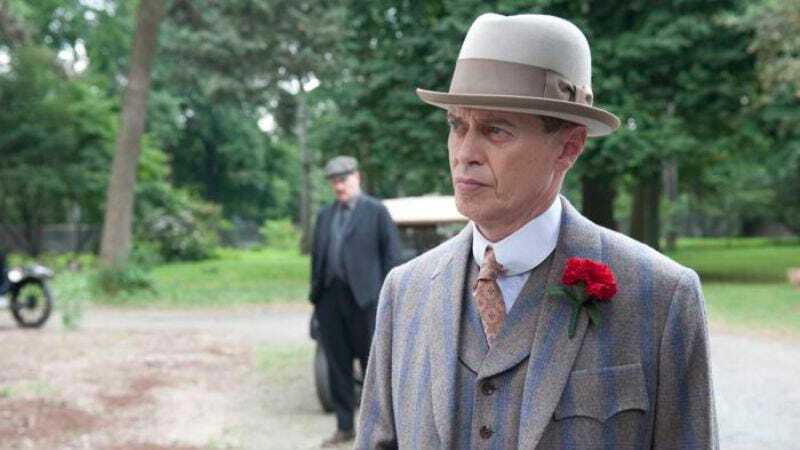 Nucky, who knows a little something about sucker-deals because he just spent the last episode of Boardwalk Empire doing the suckering, wants to know why McGarrigle and his associates will trust the English but won’t trust Nucky. Like last week’s Boardwalk Empire, “Battle Of The Century” struck me as a little scattered: more intended to set up future action than action-packed in and of itself. That was the case thematically as well. Just as Emily’s unshakeable fever last week added an extra layer of dread to Nucky’s rope-a-dope strategy for getting back on top, so the news that Emily has polio—a development many of you predicted in the comments last week—provides a potential stumbling-block to Nucky’s complex coup. By the end of “Battle Of The Century,” for example, he’ll see what his new Irish business partners do to weak men who let sentimental attachments to children get in the way of their duty. Well, that’s the question, isn’t it? What is required of these people? Who do they ultimately have to answer to? Who’s a friend, who’s a boss, and who’s neither? That’s what our old pall Dunn Purnsley wants to know, as he washes dishes in a kitchen where he only gets a ten-minute break to eat his daily slop, and where the boss calls him “boy” because he says he doesn’t have to remember Dunn’s name. So Dunn goes to see Chalky White, showing far more deference than he did when he first met Chalky in prison. 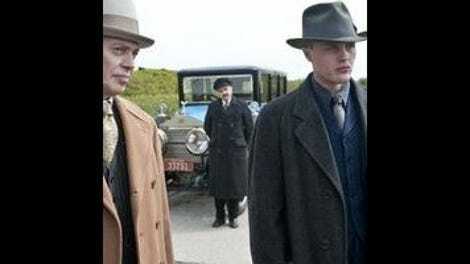 And Chalky, following the recent suggestion of Nucky Thompson, encourages Dunn to lead his co-workers in a strike. Meanwhile, Jimmy Darmody has AC dollies hitting on him while he’s in the crowd for the pay-to-listen Dempsey/Carpentier fight, and he lights up when he hears them tell him, “Everyone knows who the new king is.” But at the moment he’s a king without much of a treasury. He’s reaching out to George Remus, who’s not impressed that Jimmy’s working out of his own house, and he’s reaching out to Waxey Gordon, to see if he can shed himself of the tenacious, nagging Manny Horvitz. Alas, Waxey’s hit on Manny goes awry, and threatens to blow back on Jimmy given that the hitman carries a (conveniently) telltale matchbook from Atlantic City. As I said, “Battle Of The Century” seemed a little scattered to me, and not all of it worked. As much as I like Chalky White as a character, I feel like Boardwalk Empire has been playing a lot of over-familiar notes when it comes to the story of Atlantic City’s black community, and as I’ve been re-watching this season with my wife (who’s a few episodes behind me), I’ve found the Chalky scenes to be the most mannered and the least enjoyable to revisit. I also wish this episode had done more with the big boxing match beyond consigning it to one scene at the end, heard via radio. Even if the budget wouldn’t allow the Boardwalk Empire producers to shoot an actual match, I was expecting the event itself to be integrated into the overall plot a little more. This is also the second week in a row that an episode started in low gear coming out of the heightened intensity at the end of the previous episode, which I find a little frustrating, because it's almost as though the big dramatic events of any given hour don’t have much lasting impact. Then again, this is also the second week in a row where the slow start gives way to a strong finish. The botched-Manny-whacking scene—complete with a hatchet buried in the hit-man’s skull—was superbly staged, as was the scene where Purnsley and his cohorts fling their lunch plates at their boss’s feet, and the scene where Jimmy nervously anticipates an attack when he receives a note that reads “watching you closely” at the boxing broadcast. (I’m still not entirely convinced that note came from the floozies, even though they didn’t deny sending it.) The director of “Battle Of The Century” is Brad Anderson, who’s been responsible for some of the best episodes of Fringe, as well as some very good feature films. Here, he orchestrates some nice slow push-ins during particularly charged conversations, and one really striking shot in which John McGarrigle is executed way in the back of the frame as Nucky rides to the dock with the person who authorizes the arms deal that McGarrigle wouldn’t. That sense of being distanced from horror—but not wholly removed—pervades the other major storyline in “Battle Of The Century,” which has to do with Emily’s battle against a terrible disease. The frequently haughty Margaret is rendered all but helpless by this development, having to be ordered around—and driven around—by the family doctor, and having to stand behind glass while Emily gets a spinal tap. She has to burn all of her children’s clothes and toys and bedding, and she loses some of the staff who have kids of their own. So many tussles in this week’s episode, between rival businessmen, rival countries, the lawmen and the lawless, and humanity against biology. And over and over: A brutal lesson in American pugilism for the conquered foe. So Doyle survived Jimmy’s assault, and is apparently still on the team, albeit with a neck-brace. Annoying giggle unaffected. Well, do they have cookie jars in Ireland? As a parent, I found the spinal tap scene excruciating. Reminded me of when my son was readmitted to the hospital because of “failure to thrive” at one week old, and us having to watch as nurses jabbed IV needles into every vein they could find, including into his scalp. Just terrible. A little help, friends: What is that weird contraption full of red liquid that Nucky is eyeing in the Belfast basement? Just part of a still? No, Nucky Thompson did not invent the Tommy gun. He just has a bunch of them because he’s an American.